The inaugural Back to Hartley event was extremely successful attracting 4,000 visitors on the day and raising $5,100 for the three local charities. The success of the day was attributed by the Site Manager, Steve Ring to the fantastic support given by individuals and groups who gave freely of their time prior to and during the event. The following groups were critical to the success of the day; Lithgow Lions Club who ran the sausage sizzles and sold around $2,500 worth of sandwiches and drinks; Hartley Progress Association; St. Johns Anglican ladies who did and absolutely brilliant job with the scones and tea in the former Post Office; Hartley Rural Fire Service; Hartley Advisory Committee and the Lithgow Optimus Club. Steve had hoped to have a bbq for all the volunteers within a few weeks of the event to thank everyone but time has gotten away and all the volunteers will be invited back in late January or early February. Special mention should be made to our Town Crier on the day Tim Trevor Jones, who did a fantastic job on the day. Special mention should be made to the entertainers who set the atmosphere for the day: The Lithgow Folk Club, Sally Anne’s Dancers, the Lithgow Line Dances, Lithgow Highland Pipe Band, Lithgow City Orchestra, Lithgow City Band the Heathens Choir, and the Blue Mountains Heritage Dancers. After the event there was a very good debrief that critically looked at what we did, what worked and what can be done better next year. 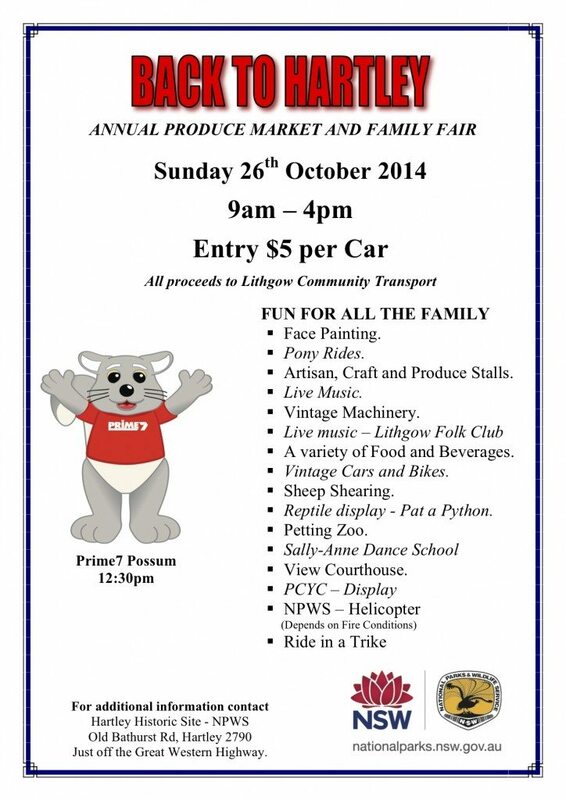 So keep Sunday 27 October, 2013 free in your diaries because with your support we will be back bigger and better, to promote our community and raise funds for local charities. Some photos taken on the day are in the Photo Gallery viewable here. Hartley Historic Site celebrates a Double Anniversary. Back to Hartley – 28 October 2012. Hartley Historic Site located at the base of Mt Victoria and just off the Great Western Highway is undergoing a major revitalisation program over the next several years to enhance the sites tourism potential and to provide enhanced facilities and services to the broader community. Total cost of the revitalisation is approximately $3.2 million dollars funded by the NSW National Parks and Wildlife Service. Steve Ring, Manager of Hartley Historic Site said this year we are very excited to be commencing what we anticipate will be an annual event called “Back to Hartley” which will be in partnership with the local community to raise awareness of the site and its history, to raise funds for three local charities and to promote the wonders of the Central West. This year is particularly important for us as the event will also mark the 40th anniversary of the gazettal of Hartley Historic Site and the 175th anniversary of the construction of the Mortimer Lewis designed Courthouse. Event goers will be encouraged to walk around Hartley Historic Site and experience the beauty and vibrancy of the historic village, and celebrate everything that’s wonderful about the Local district and Central West. “Back to Hartley” will provide an outstanding opportunity for locals and visitors alike to access the large number of cultural and community groups which operate in the region, as well as finding out how to become more involved in community life. The Event will showcase a variety of arts, crafts and produce from our region, plants, entertainment, vintage cars and bikes, live music, a selection of food and drinks including Devonshire teas and a sausage sizzle showcasing local “Lithgow free range Shogun Waygu – meat”, Come and meet some of our native animals up close at the Taronga zoo mobile, Australian Museum – park in a box, sheep shearing, wood chopping or even try your hand at Archery, self guided tours of the Courthouse and much more. 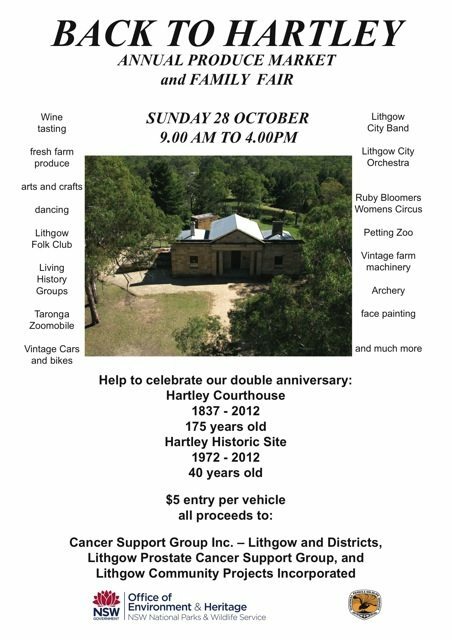 “Back to Hartley” will be at Hartley Historic Site, Old Bathurst Road, Hartley NSW 2790 on Sunday 28th October 2012 from 9am – 4 pm.